It is an honor and delight to have all of you here this morning to share the simcha of the aufruf of Uri Arkin, son of Mordechai and Yehudah Arkin, whose marriage to Sarah Krimins, daughter of Dave and Roz Krimins, takes place before G-d, tomorrow during Chanukah in our sanctuary. What a wonderful Simchat! We are so thankful to the Arkin family who chose to have the aufruf at Kneseth Israel Synagogue. Kneseth Israel is no strange place to the Krimins family. Their four children were Bar and Bat-Mitzvahed here. From the time they settled in this area, they joined our congregation and became beloved, valued members. Our sages teach us that each marriage ceremony is a re-enactment of the marriage between G-d and Israel that took place at Mt. Sinai. In Jewish tradition, a wedding is not merely a personal or even a family celebration, but rather a cause for rejoicing for the entire community. For today, a new home is established; a new family created; another link forged in the golden chain of Jewish community that goes back over 3,000 years. 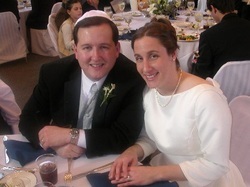 I am proud to say that Uri and Sarah have decided to build a small sanctuary in their home and heart--mikdash mea’at, to build a kosher home—a correct decision that will continue the dreams and hopes of their ancestors. Today, we read the Torah portion that describes the dream of Joseph and the fulfillment of those dreams. The second part of our biblical reading which Dr. Krimins recited beautifully, was the portion connected to the Festival of Lights—Hannukah. Here we learned that Joseph had many dreams-- some of them appeared esoteric. The point I want to emphasize is that despite the improbability of certain dreams, the divine presence is always there, thus dreams can become reality with G-d’s help. First I would like to share with you some insight correlating our topic of dreams to this special Shabbat before the wedding of Uri and Sarah. Uri comes from a very special family. His father Mordechai Arkin was a survivor of WWII. I had the privilege of meeting Mordechai, last summer, when he shared with me great insights about his own life plus the events that shaped his outlooks for himself and for the future generations of his family. When Mordechai was a young man, he served in the Russian Army. His father, Yehudah, was a very important religious observant Jew who despite the hardships of communism, managed to maintain a life of Mitzvah and Jewish traditions. The principles that Yehudah, the grandfather of the groom fought for all of his life were perpetuated to his son, Mordechai—the fire to fight for their faith despite any obstacles, as he remained a practicing observant Jew in Russia. Mordechai went through the war and experienced great victory. His spirit remained high. His hope for a good future as an observant Jew remained strong. His dream to see a future generation enjoy the freedom to follow a Torah life was his primary ambition. When he met a young Hungarian lady named Judith in a Liberation camp, his dream was almost complete. After the war, they married and decided to immigrate to the free world—to America. Coming to the USA was not an easy feat for them; language, traditions and customs were all strange. But, the spirits of Mordechai and Judith remained strong. Both displayed courage and determination like the same biblical characters named: Mordechai, in the story of Purim, and Judith in the story of Chanukah. Their dreams will come true tomorrow by the marriage of their son Uri – his name meaning light, to Sarah, the name of our first matriarch - who in the Bible lit candles in her home and taught others to live Jewishly. The Ba’al Shem Tov said: "from every human being there rises a light that reaches straight to heaven and when two souls that are destined to be together find each other, their streams of light flow together and a single brighter light goes forth from their united being…"
Additionally, we believe that the souls of the couple’s ancestors, although physically not here, are with us spiritually. The soul of the grandfather, Yehudah, who tried to observe Jewish life with his choices despite great risks, would have great satisfaction – nacas - to see the future generations upholding a kosher home and the life that they dreamed and strived for. Mr. Shlomo Krimins, as well as Mr. Sam Pepper, the grandparents of the bride, like Barbara, the only living grandmother –also had a dream….part of their dream came true, that Dr. and Mrs. Krimins were respected medical professionals in the community. Another great dream for them comes true tomorrow by having Sarah, their daughter, commence a new Jewish home and the start of a life with her future family as an observant Jew. Under the canopy where the bride and groom will be standing are two Talitot. These talitot, belonged to the two paternal grandfathers, Mr. Yehudah, and Mr. Shlomo Krimins. How symbolic that these prayer shawls will be covering the heads of the bride and groom.